Local Materials: Readymix concrete is made from local raw materials. In addition, most worksites are within a few km's of a Readymix Plant. Lower Maintenance Costs: The longevity of the material allows it to withstand allows people to build structures that are both slender and very strong.very extreme temperatures and degrees of humidity. Consequently, structures or buildings made of concrete are the best long-term investments. Thermal Insulation: The ability of readymix concrete to absorb heat during daytime and to return it in the cool of the night makes it the ideal material for building comfortable homes. Sound Insulation: Well-built readymix concrete structures allow very good levels to be reached in this field. Workability: Readymix concrete can be pumped over long distances, horizontally and vertically, to its place of use. It can be fluidized (plasticised) sufficiently to make it flow easily. Conversely, it can be made sufficiently compact, dense and thick to protect a radioactive area completely.Safety: Readymix concrete provides excellent conditions of sterility and hygiene. Plasticity of Shapes: Readymix concrete allows complex and curved shapes more effectively than any other material. Flexibility: Readymix concrete is highly adaptable to the specific needs of different worksites. Design and Beautification: Readymix concrete can be used with a wide range of colours, patterns and textures. Different combinations of these can produce spectacular effects. 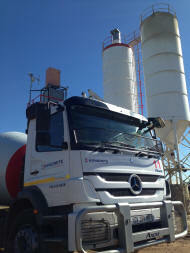 Deliveries of readymix concrete can be taken directly from the readymix plants or the concrete can be delivered to worksites by concrete mixer trucks. The pace of deliveries can be adapted to the customer's needs and can change from one hour or day to the next. The use of readymix concrete keeps worksite nuisance (dirt, congestion, noise, etc) to minimum levels.